The audit report of the Works Corporation Ltd (WCL) for 2011 has exposed allegedly corrupt practices at the 100 percent government-owned company. Since the corporation did not compile its financial statement for 2011, as mandated by its charter and the Company’s Act, the press release noted that auditors reviewed selected transactions of the WCL. The WCL was created by the administration of former President Mohamed Nasheed on March 25, 2009 to facilitate or carry out infrastructure projects. Of the 34 projects awarded to the company in 2010 and 2011, the audit found that the government canceled 24 after the WCL failed to commence work. “The government awarded the projects without adequate planning and without assessing the company’s capability to carry out the work,” the press release stated. As the company had completed only one infrastructure project to date, the Auditor General’s Office suggested that the WCL had not served the purpose for which it was formed. Auditors discovered that the company’s managing director withdrew MVR180,000 (US$11,673), ostensibly to cover expenses for assisting the President’s Office in preparations for a ceremony held in Gulhifalhu. While the company’s employees actively participated in the preparations, the report noted that the sum was withdrawn without any documentation proving the actual cost borne by the WCL. Although the audit report did not identify the managing director, local media has revealed that the WCL MD in 2011 was Abdulla Javid ‘Jaa’, son-in-law of the then-ruling Maldivian Democratic Party’s (MDP) Chairperson ‘Reeko’ Moosa Manik. Auditors also found that MVR146,999 (US$9,533) was transferred to the MD’s personal bank account to purchase a “total station” containing special tools from Singapore’s Tepcon Posting Sales Pvt Ltd. However, the company had received neither the tools nor the transferred amount as of the report’s publication date. Moreover, the WCL did not recover 14 sheet piles provided in May 2011 to Heavy Load Maldives Pvt Ltd, which was owned by the MD’s father-in-law MP ‘Reeko’ Moosa. The WCL’s staff informed auditors that the 40-feet sheet piles were released after the MD called the deputy manager at the company’s Thilafushi site and instructed him to do so. The audit report revealed that on the orders of the MD the WCL also provided electricity from its Thilafushi site to the Yacht Tours Maldives’ site on the industrial island. Yacht Tours Maldives – owned by MDP MP Abdulla Jabir – had not paid WCL for 37,376 units of electricity used from December 28, 2010 to October 1, 2012, the audit found. The WCL awarded 12 projects worth MVR198.6 million (US$13 million) to various parties in violation of the company’s procurement rules, the audit found. The company’s procurement procedures manual stated that contracts worth MVR1.5 million (US$97,276) or higher must be awarded through the Finance Ministry’s tender evaluation board. However, the audit noted, the 12 projects were awarded without either a bidding process or the involvement of the tender evaluation board. An Indian company – identified as MM Export Pvt Ltd – contracted to supply reinforcement boulders was paid MVR2.7 million (US$175,097) in violation of the procurement rules as well as the WCL’s agreement with the company. In another instance, a Sri Lankan company named Sri Krithika International was paid in excess of the stipulated amount for supplying construction material after the company imported a higher volume than was agreed upon. Moreover, the WCL failed to recover MVR1.7 million (US$110,246) paid to Design-built Solutions Pvt Ltd as an advance payment for the Noonu Velidhoo harbour project despite termination of the agreement after the company did not commence work. 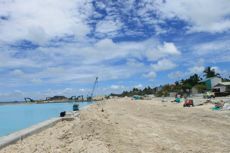 In a similar case, a company named Coastal Ventures Pvt Ltd was paid MVR5 million (US$324,254) for the construction of a harbour in Raa Fainu despite the company only completing a portion of the project. As the portion completed by the company was worth MVR2.9 million (US$188,067), the audit noted that the company was paid MVR2.1 million (US$136,186) for work not done. The report also contended that the WCL prioritised the interests of subcontractors in drafting agreements to the detriment of the company. Auditors discovered that the company was owed MVR134,055 (US$8,694) in unpaid rentals and sale of equipment. The WCL also misused a MVR50 million (US$3.2 million) stand-by credit facility provided by the Indian government to establish a sewerage system in Noonu Miladhoo and to construct a harbour in Noonu Kudafari. Interest for the loan was rising as a result of the WCL failing to make regular payments, the report noted. Meanwhile, as a result of poor record keeping, auditors were unable to ascertain the amount of money kept in the WCL safe when it was stolen in 2011. While the company’s accounting systems showed that it was owed MVR22.5 million (US$1.5 million) from various parties, the audit report noted that the company’s financial book-keeping was too unreliable to establish the validity of the figure. Similarly, auditors could not verify whether the MVR60.7 million (US$4 million) owed by the WCL for procurements and services was authentic. The company also paid its chairman more than MVR600,000 (US$38,910) as a “special allowance” from June 2009 to February 2012 against the pay scheme for board members of state-owned enterprises. Lastly, the WCL had not maintained a registry of its assets since April 14, 2010, auditors found. The parliamentary debate on the budget proposed for 2014 began today with MPs of the opposition Maldivian Democratic Party (MDP) calling on the newly-elected coalition government to fulfil its campaign pledges. MDP MP Ali Waheed urged the new administration to submit its legislative agenda to parliament and incorporate its policies in next year’s budget. “Very big promises have been made to the people. Our grandmothers and grandfathers want MVR5,000 (US$325) in their accounts at the end of this month, MVR5,000 each, so total MVR10,000 if it’s a couple. “Each of our citizens want a doctor in our homes at the end of the month [as pledged by the PPM]. They are clearing out the room intended for the guesthouse for the new doctor. Our fishermen are expecting MVR10,000 a month subsidies (US$650). Fishing is not too good right now,” he said. Referring to the Progressive Party of Maldives’ (PPM) pledges to raise the old age pension and designate a doctor for each family, Ali Waheed said the opposition party would vote for a budget that reflected the campaign promises. “Our responsibility is to be the people’s eyes in this Majlis. People want us to watch over and hold this government accountable,” the MDP deputy parliamentary group leader said. Most MPs suggested that the new government should be able to submit a revised budget based on the PPM manifesto. Speaker Abdulla Shahid explained that amendments brought to the Public Finance Act stipulates that the budget must be submitted by the end of October. Parliamentary rules however allow the government to “include components of their new budget” through the Budget Review Committee, he said. Reappointed Finance Minister Abdulla Jihad told local media today that the government did not plan to submit a supplementary budget or reduce recurrent expenditure but would propose changes to the Public Sector Investment Program (PSIP). Jihad stressed that the proposed revenue raising measures should be approved by parliament to finance new infrastructure projects. The measures include hiking T-GST (Tourism Goods and Services Tax) to 12 percent from 8 percent, revising import duties, deferring abolishing the tourism bed tax for one more year, raising the airport departure charge from foreign passengers from US$18 to US$25, leasing 12 islands for resort development and introducing GST for telecommunication services (currently exempt from the tax). During today’s debate, MP for Shaviyani Kanditheemu, Mohamed Hussain, who left the Dhivehi Rayyithunge Party (DRP) in April and remains an independent, said there were “serious problems” with the budget and that 2013 was an “empty year” for his constituency. None of the projects included in the 2013 budget for the islands he represent was carried out this year, he said, while some have been omitted from the 2014 budget. Former President Dr Mohamed Waheed laid the foundation stones for a new school and mosque in Shaviyani Feydhoo in January, he added, but the projects did not commence and were not included in next year’s budget. DRP MP Hassan Latheef, who represents the Hithadhoo south constituency in Addu City, said there were no projects for the southernmost atoll apart from establishing water and sanitation systems. Latheef objected to only MVR45 million (US$2.9 million) allocated for Addu City, which he contended was disproportionate for a population of 32,000. MDP MP Mohamed Riyaz meanwhile expressed concern with the PPM backtracking on its pledges, by claiming that campaign banners with these promises were put up by supporters rather than the party itself. PPM MP Abdul Azeez Jamal Abubakur appealed for new sources of revenue and cost-cutting measures to be included in the budget. Azeez also noted that projects in the 2013 budget for his constituency in Laamu Maavah did not proceed and have been omitted from next year’s budget. PPM MP Ahmed ‘Redwave’ Saleem urged the government to reduce MVR2 billion (US$129 million) from recurrent expenditure, which accounts for 73 percent of government spending. PPM MP Abdulla Raheem Abdulla meanwhile thanked opposition MPs for assuring their assistance and cooperation to the new administration. The PPM deputy leader also said that the budget had to be revised for the PPM to deliver on its campaign pledges. He added that the government would provide the financial benefits that were promised. “The budget has to be prepared in a way that we can fulfil the promises,” he said. Several MPs expressed concern with the high recurrent expenditure compared to capital investments. While the projected revenue for 2014 is MVR13.9 billion (US$901 million), recurrent expenditure – wages, subsidies and administrative costs – stands at MVR12 billion (US$778 million). The budget deficit is estimated to be MVR988 million (US$64 million) or 2.5 percent of GDP, according to the Finance Ministry. Indian infrastructure giant GMR has handed Ibrahim Nasir International Airport (INIA) over to the state-owned Maldives Airports Company Limited (MACL), after the Maldivian government voided the concession agreement and gave it seven days to leave the country. The sudden eviction of the developer – which won a 25 year concession under the former government to manage and upgrade the airport – scraps the project, which at US$511 million was the single largest foreign investment in the Maldives. GMR had clung to the terms of its concession agreement while the government fanned growing nationalistic and anti-India sentiment. On November 27, President Mohamed Waheed’s cabinet declared the agreement ‘void ab initio’ – invalid from the outset – and ordered the developer to leave. With arbitration proceedings already underway in Singapore over the contested airport development charge (ADC), GMR received a stay order on its eviction and appeared confident of its legal position even as the government declared that it would disregard the ruling and proceed with the eviction as planned. That verdict, effectively legalising the sovereign eviction of foreign investors regardless of contractual termination clauses or pending arbitration proceedings, was “completely unexpected”, according to one GMR insider – “the lawyers are still in shock”. A last ditch request for a review of the decision was rejected, as was a second attempt at an injunction filed by Axis Bank, GMR’s lender to the value of US$350 million. “In deference to the orders of the Court of Appeals, Singapore; GMR Male International Airport Ltd (GMIAL) will facilitate a smooth takeover of the Ibrahim Nasir International Airport (INIA) by the Maldives Airport Company Ltd (MACL), effective midnight tonight. GMIAL has been assured that as a result of this takeover all its employees, suppliers and other interested parties will not be put to any inconvenience. GMIAL remains committed to finding a suitable solution to this situation. We are taking requisite steps to work out the compensation receivable from the Government of Maldives, keeping in mind the judgement of the aforementioned court and the concession agreement dated 28th June 2010. An invitation-only press conference to mark the handover was held by Defence and Acting Transport Minister Mohamed Nazim in the airport VIP lounge at midnight. Minivan News understands that GMR did not participate for legal reasons. During the ceremony, Finance Minister Abdulla Jihad presented the official handover documents to MACL Managing Director Mohamed Ibrahim, and said that the Maldives would pay whatever compensation was required “however difficult”. “Investor confidence will only increase when they know that Maldives will do everything in accordance with the law,” Haveeru reported the minister as saying. Attorney General Azima Shukoor expressed hope that the compensation would be lower than anticipated. Estimates as to the amount of compensation for which the government is liable have ranged from the US$220-240 million GMR estimated it has already invested, up to US$700 million – a sizeable chunk of the country’s GDP. Apart from the size of the compensation is the Maldives’ ability to ultimately pay, given the crippled state of its domestic economy. Finance Minister Jihad in late October warned that the Maldives would be unable to pay government salaries without a promised US$25 million loan from India. A month later, amid rising anti-India sentiment over the GMR issue and a diplomatic incident triggered by the government’s spokesperson, Jihad described India’s calling in of US$100 million in existing loans as “not a major concern”. The debts, he said, would be paid from the state’s reserves, which local media at the time reported could fall to as low as US$140 million (MVR2.2 billion) once the payments to India were settled. Further pressure on reserves came from a ballooning public debt ratio, “which now stands at over 80 percent of GDP, and has helped to boost national imports, thus worsening dollar shortages in the economy and putting pressure on reserves,” the IMF warned. Presenting the 2013 budget to parliament in late November, Jihad warned of “bitter consequences” should the spending trend continue. His target budget deficit of 6.1 percent in 2013 takes into account a raft proposed revenue raising and cost cutting measures which would impact the tourism industry – such a proposed tourism GST increase to 15 percent – and require parliamentary approval. Further modernisation of the airport – or even completion of the existing upgrade – is likely to require extensive outside assistance or further loans. The rusting foundations of GMR’s new terminal sits on 60 hectares of newly reclaimed land on the airport island, after the government ordered a halt to the development in August. Large sections of the old terminal remain boarded up for construction work, which the government’s ability to proceed with is in doubt. “The tender will be floated by the Maldives government in a transparent manner and after consulting investors. The mistakes made during the float of the tender which has been cancelled will not be repeated,” Imad told the paper. “We are obviously in need of funds and technical assistance as we do not have the financial means, the technical know-how or the capacity to address these huge climate change issues,” said Mariyam, in an appeal for assistance with climate adaptation. The government has dismissed speculation Chinese involvement in the development, however Minivan News has learned that senior Chinese military officials landed at the airport in the tense week leading up to the handover, even as India warned of “adverse consequences” should the government proceed with forceful eviction. India’s reaction after the Singapore Supreme court ruling was muted. Ministry of External Affairs Spokesperson Syed Akbaruddin said the ministry was “studying” the judgement and that their lawyers “need to understand it”. “There are two issues in the case – one the sovereign right of a nation and other the legality of the agreement, which was linked to compensation to GMR and its associates in Malaysia, he said the latter part has not been “affected or responded” in today’s judgement. “These issues are not affected with the judgement or not responded to. Fulfilment of all legal process and requirement is what we want to see in this case and we hope that all relevant contracts and agreements would be adhered to and all legal process are carried through,” he said. The development of housing, industry, and transportation infrastructure is expected to greatly improve the “extreme” situation on Male’, said Infrastructure Development Ambassador Sarangu Adam Manik. “There are more people in Male who do not have housing than people who do,” he said. The capital Male’ has a land area of less than two square kilometers but is home to one-third of the country’s population or approximately 125,000 people residing in an estimated 16,000 households; the total number of households in the Maldives is estimated to be 46,000. With 50,000 people per square kilometer Male’ is the most densely populated city in the world, outdoing Mumbai’s 33,000 people per square kilometre. President Mohamed Nasheed previously said the “household is the main engine of development.” Making good on this claim, he yesterday conferred land tenure agreements to 20 parties who had applied for housing and housing grants to 27 applicants, saying the government intends to provide housing for all 21,000 applicants to the Veshi Fahi Male’ housing program. Earlier this year, ten flats were awarded under the same program. The government originally pledged 10,000 flats. Under phase one of the project launched in January, a total of 1,000 parties were invited to apply for the housing scheme. Over 8,000 application forms were submitted on the first day. The Cabinet also approved related projects including the development of a container park in Thilafushi to incentivise relocating warehouses in Male’ and construction of a multi-purpose local market with modern facilities for residents of Male’. The programme was launched on November 10, 2010 with the aim of combining the development of Malé, Vilingili, Guli Falhu, Thilafushi, Hulhumalé and Malé International Airport. Manik said the network of projects will jointly reduce the stress on Male’. “Gulhifalhu will help tremendously the housing and economic situation. Thilafushi will centralise the industrial sector, and the bridge will improve mobility–all components will help the situation on Male’,” he surmised. The Cabinet yesterday decided to proceed with the plan to construct a bridge between Male and Hulhule, a reclaimed island attached to Hulhumale. Since Hulhumale’s population is expected to double in the next year as people take advantage of new housing opportunities, mobility will become an issue, Manik said. “Think about it, you will have two to three thousand flats, each with a family of four or more people on average. That’s eight to twelve thousand people,” he pointed out. He also noted that the current boat-based system is vulnerable to changes in weather. Reflecting on public complaints of some infrastructure development programs, Manik surmised that “everybody wants to be the khafir except the khafir. A South Asian Association for Regional Cooperation (SAARC) Carnival will complement the November SAARC summit scheduled to be held in Addu City and Fuvammulah, President Mohamed Nasheed said in his radio address last weekend. Various exhibitions and cultural events by local and regional groups are being planned for the carnival, which scheduled for the first two weeks of November. Preparations for the SAARC summit have brought new infrastructure and development to Addu. The president said the summit would also give greater exposure to development projects and business ventures in the Maldives, and create new markets for Maldivian exports. The two-day SAARC summit, grouping eight nations, will open on November 10. The Maldivian prison population could be reduced by up to two-thirds if the government would “de-criminalise the offence of drug usage and propose mandatory rehabilitation”, according a report by the government and the United Nations Development Program (UNDP). The reform could reduce the number of youth incarcerated for minor offences, the report suggested. The “Prison Assessment and Proposed Rehabilitation and Reintegration of Offenders Report“, published on September 5, was conducted by Dr Aishath Ali Naaz and UNDP program specialist Naaz Aminath. The report surveyed 60 percent of the prison population as of February 2011 to assess current prison conditions and make recommendations. It is the first report of this scope to be done in the Maldives. Aminath said the report took five months to prepare. “It involved very consistent record-taking and visits to prisons. About part way through we realized that we needed a legal framework to make a more comprehensive report, so we met with MPs across the board to understand the strengths and weaknesses.” The team had met with government officials throughout the project. Aminath said timing the release of the report was difficult after the release of prisoners from Maafushi prison in July. Key issues identified in the report were a lack of legislative framework to support rehabilitation and reintegration programs; widespread accusations of corruption and inappropriate political influence among institutions; poor prison design; and inadequate budgeting and human resources. The report’s first recommendation for reform was to “de-criminalise the offense of drug usage” and require rehabilitation, according to the offender’s criminal record. A second recommendation to “establish a restorative justice program to minimize offenders being incarcerated for minor offences” would regulate the currently heavy flow of Maldivian youth into the prison system. Of prisoners in the Maldives, the majority are males under 30 years of age who are educated below O-levels. At the time of the report, 66 percent of inmates polled were in jail for drug use or possession. The report criticised Maldivian prisons for being understaffed and poorly managed. 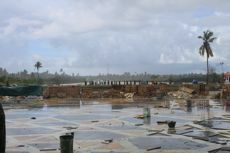 After the fires in 2009, Maafushi prison in March and October 2009, Aminath said that basic living equipment like mattresses were not replaced. Maafushi and Male prisons do not have kitchens, and “there is no structure to support the prisoners who are there,” she said. Asseyri prison was originally designed as a juvenile rehabilitation center. But Aminath noted that it remained empty until this past year, and since then has been filled with inmates of all ages. She said individuals she asked regarding it’s changed purpose were uniformed. Inmates surveyed said medical services were inadequate. An investigation found that Maafushi prison compensated by sending an average of ten people to Male each day for medical purposes–an excursion which opens opportunities for smuggling good into prison. Inmates also complained about a lack of structure in prison life. The report lists claims of torture, inhumane treatment, drug availability and false messages of hope from politicians as examples. Naaz and Aminath asked prisoners to describe the types of rehab programs they felt were needed. Most recommended religious education (86.4 percent), counseling therapies (76.1 percent) and life skills (75.1 percent). Among the report’s recommendations for reform is the development of a Mental Health act. It also encourages Parliament to pass legislation that was proposed 3 years ago, including a criminal procedure code, a penal code, an evidence act, and a parole bill. Another suggestion is to establish a prison industry to train prisoners in vocational skills, a program that would directly support rehabilitation and reintegration programs. Aminath said the research team is in conversation with the State Minister, and the Home Minister supports the recommendations. Correction: A previous version of this story stated that the UNDP team had “‘met with government officials across the board to understand the strengths and weaknesses. '” It should have stated that the UNDP team had “met with MPs across the board to understand the strengths and weaknesses and advocate passing legislative framework bills.” The UNDP team had been in correspondence with government officials from the beginning of the project.